Upstate Shredding has made an unsolicited offer to buy Fenix Parts for $0.50 a share in what appears to be a more than $10 million cash bid. Fenix Parts wasn’t going to report such dealmaking publicly, but confirmed Upstate Shredding’s bid after the latter announced Feb. 9 an offer of nearly double Fenix Parts’ Feb. 8 close price of $0.27 a share. The last reported common stock volume for Fenix Parts was 20,327,685 on July 20, 2017. Using that number would mean Upstate Shredding — one of the largest scrap metal outfits in the country — would be paying about $10.16 million for Fenix Parts. The company’s stock sat at about $0.46 a share late Tuesday afternoon, likely buoyed by takeover speculation. 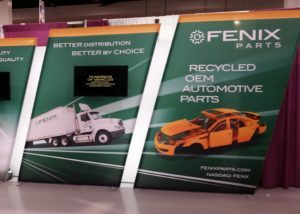 “Fenix is in the business of automotive recycling and has many characteristics that are attractive to Upstate,” Upstate Shredding wrote Feb. 8. Fenix has made strides since its switch to the pink sheets. The company filed its 2016 10-K in July 2017, and it filed its first-quarter 2017 report in October 2017. The company reported that net revenues grew 6 percent over January-March 2016 to reach $34.1 million, with recycled parts sales growing from $28.3 million to $29.2 million. Early last month, Fenix announced it had reached a forbearance agreement with creditors BMO Harris Bank and BMO Harris’ Canadian Bank of Montreal, from which it appears to have borrowed at least $21 million. The companies could have taken action against Fenix for failing to issue quarterlies and meet certain financial obligations, but have agreed not to do so until Feb. 28. They’ve also agreed to let Fenix add its 2017 interest payments to its principal and defer the principal payments owed until Feb. 28. Finally, on Jan. 19, Fenix announced that the Securities and Exchange Commission ended its inquiry without taking action — which ought to further boost the company’s financial health. The company’s dwindling number of shareholders and Nasdaq delisting also meant it could halt quarterly, annual, and other SEC filings, which could also help. Fenix Parts will instead produce “periodic updates,” and reported Jan. 19 that for the nine months ended Sept. 30, 2017, saw $96.6 million in revenue. That tally had been reduced from the $99 million the prior year by an April 2017 fire that shut down an $8 million-a-year Toronto facility and an 8 percent reduction in car buying that left less inventory to sell. The 16-location (counting the closed Toronto site) Fenix remains an interesting company to watch because its concept of consolidating salvage yards seems like a plausible corollary to the consolidation going on in the collision repair and paint and equipment distributor sectors. Based on the company’s prospectus, there’s plenty of room for it or someone else to grow to be a clear No. 2 to LKQ.